The Pen Rod – Mightier Than The Sword? What is going on? If I was only allowed to go fishing once a year, then I would choose to go fishing in September. It has for me, been the best month for as long as I can remember. We still have all the summer fish around, but the first of the winter species are starting to make an appearance. I am going to stick my neck out on the line again and once again forecast Bass and Cod over the next two days on Chesil (Friday and Saturday). The conditions are currently rough and will remain so until mid morning on Saturday. With waves in excess of 2m the seabed is being ripped up and lots of food is being released into the water. If you want to see what conditions were like on my last live video feed, I have included the video below. I have had quite a few messages from anglers looking to target squid around Weymouth. Most have said that they don’t believe that there are any squid in the area yet. Have a look at this amazing underwater footage from Colin Garrett, It was filmed this week n Newtons Cove, Weymouth, showing Squid, Red Mullet, Sole, Rays and Bass. Chesil Beach: Rough with coloured water. Portland: 2m swell with coloured water. 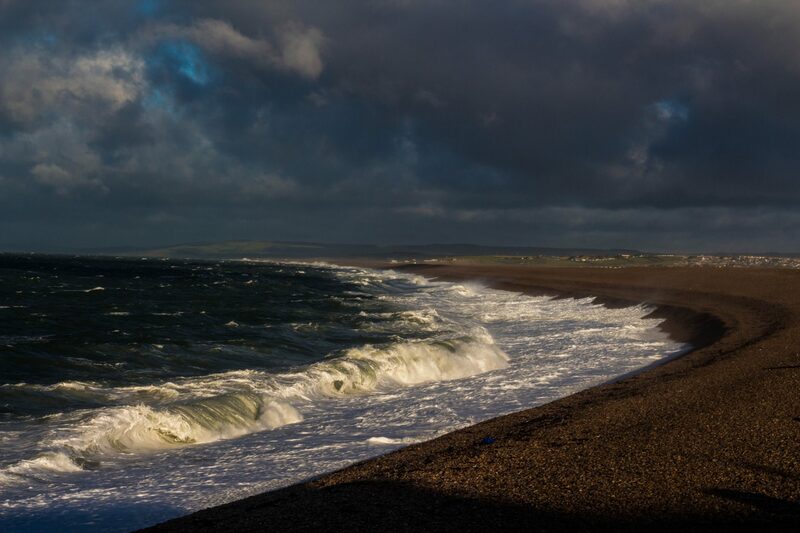 Chesil Beach forecast: It looks like a great day for some Bass and Cod today. I can see it carrying on through to Saturday, but as the winds are due to die off again tomorrow, it will probably be fairly quiet on Sunday. Expect Dogfish, Rays and Pout both during the day and at night. You can pretty much rule out Mackerel from Chesil, but there is still the chance of Bream and Gurnard. 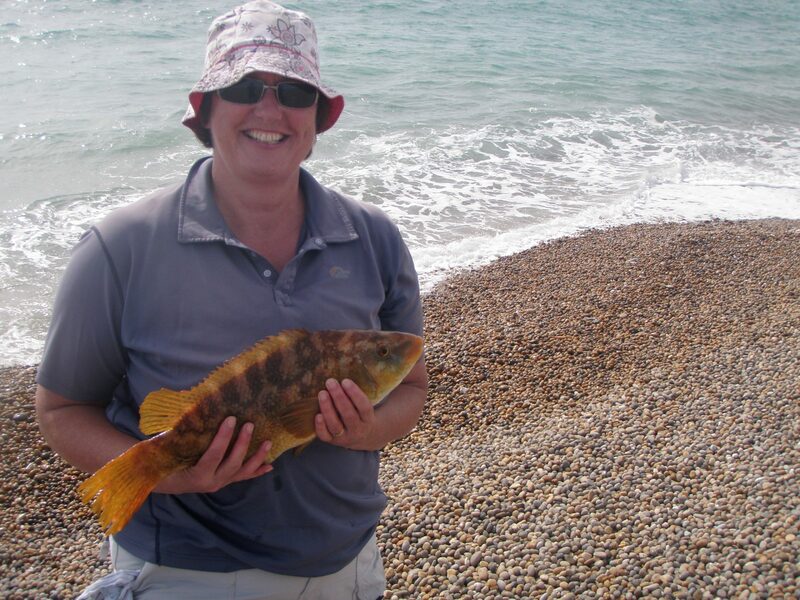 Bridget Herniman sent me this picture of a Wrasse she recently caught from Chesil. I don’t think we will see many more of those until the water clears again. Some of you may remember Bridget from last year. She was on a trip to Chesil with her Husband. After a few hours of not catching much Bridget decided to have a short nap. Her hubby Steve decided to try for some Mackerel on her rod. Much to his amusement and delight, he hooked and landed a 5lb Cod on them. Bridget assures me she won’t be snoozing when the Cod season comes round again this year. Portland: I was surprised how quickly the water coloured up yesterday. It will be even worse today. Despite the colour of the water, one hardy angler put up with the wind and the spray and ended up with a number of nice Wrasse. I was slightly surprised that he didn’t pick up any Bass, as the conditions looked near perfect. With a large swell thumping into Church Ope Cove, it would be a good venue for a number of species today. You will have the added bonus of being out of the wind. Portland Harbour: Lots of Garfish and Scad present in the harbour. Flounder and Bass should also show around Sandsfoot sailing club and Ferrybridge. Weymouth Bay: Keep trying for the squid, would be my advice. They are around and the guys fishing for them around Bournemouth are reporting increased numbers. You still have the opportunity to catch Wrasse, Bream, Pollock ad Garfish from both the stone and pleasure pier. One Response to "Fishing in September, the best month of the year"